Zero: Shah Rukh Khan's Bauua Singh Sitting On a Ledge With a Chimp is the Most WTF Poster of the Year! Okay, are we making a Bollywood version of Hollywood flick Dunston Checks In with Zero? The trailers of this much-anticipated film did not even hint at a primate sharing screen with its human counterparts, and yet now we have a poster that says otherwise. 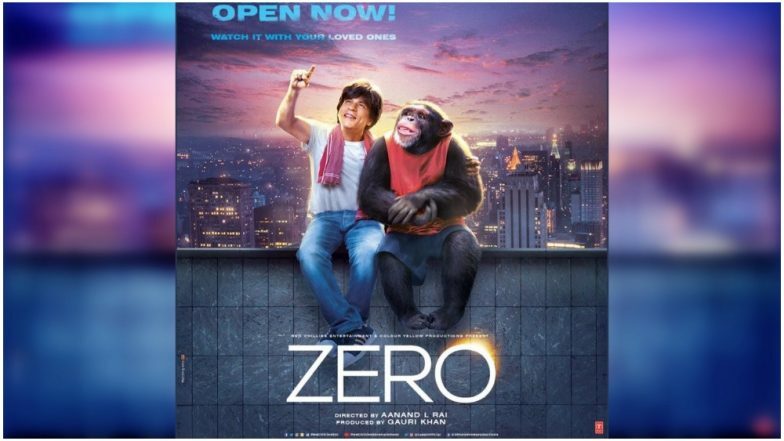 The very interesting and definitely quirky poster has Shah Rukh Khan's character Bauua Singh sitting on a ledge with a chimp, dressed in a red vest, like old buddies, with Bauua Singh pointing at something in the sky. Totally WTF! Zero Becomes India’s First Movie to Launch Snapchat Lens! Its Lights, Camera, Snap for SRK-Starrer. As per a leaked CBFC cuts document for Zero, the chimp is called Diya! Also it was a name that Censor Board wanted to be changed to. So not only does the primate has a role in the film, its original name also seems to be something that bothered the Censors. That said, Shah Rukh Khan's left arm seems very long and his fingers wrapped around the chimp's arm looks very weird! Zero is directed by Aanand L Rai, and also stars Katrina Kaif and Anushka Sharma. Shah Rukh Khan plays a vertically challenged man in the film, while Anushka and Katrina play a paraplegic scientist and an alcoholic actress respectively. Zero is all set to release on December 21.